Wind Load Certificates for windows, doors, shutters, and more! In the South Florida Area? 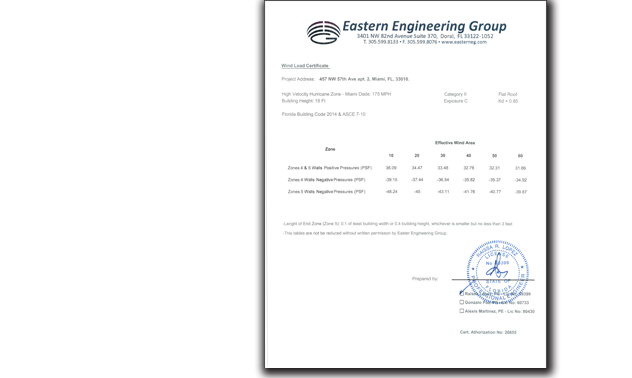 Pick up your Wind Load Certificate for free! Free professionally signed and stamped Wind Load Certificate, for a limited time. We will have your signed and stamped Wind Load Certificate ready for pick-up or delivery within minutes of your submission. Simply enter a few required fields and hit the submit button. Getting a Wind Load Certificate has never been so simple. For a limited time, we will be providing free Wind Load Certificates to clients in South Florida. All you need to do is submit your info, then schedule your pick-up. This offer is only valid for pick-up. WindLoadCertificate.com offers an array of delivery options including next day delivery. Simply select your shipping option and submit your request. We will ship to any location on the planet! Gonzalo A. Paz is a Civil Engineer with over 20 years of experience and Vice President of Eastern Engineering Group. Raissa Lopez is a Structural Engineer with over 20 years of experience and President of Eastern Engineering Group. Alexis Martinez is a Structural Engineer with over 10 years of experience and Project Manager at Eastern Engineering Group. "The most professional engineering firm I have known by far. From the simplest to the most complex and challenging projects, they excel." "This service makes the certification process easy. 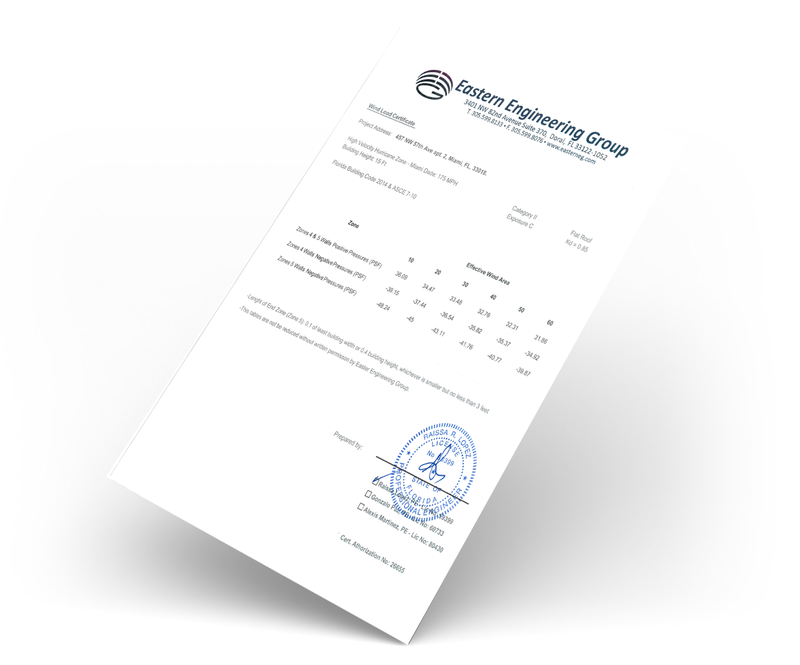 Best of all, it is free!”"
Eastern Engineering Group was founded in 2005 by Raissa Lopez (President), Fernando Torres (Vice-President) and Gonzalo Paz (Vice-President) in Miami, FL. Our clients include private investors, architects, contractors, manufacturers, and public agencies at every levels of government. We are always here to answer your questions, concerns, and comments.